A short time ago, athletes gathered in Louisville for another Ironman race. I had three athletes racing in midst of a little over 2500 athletes. 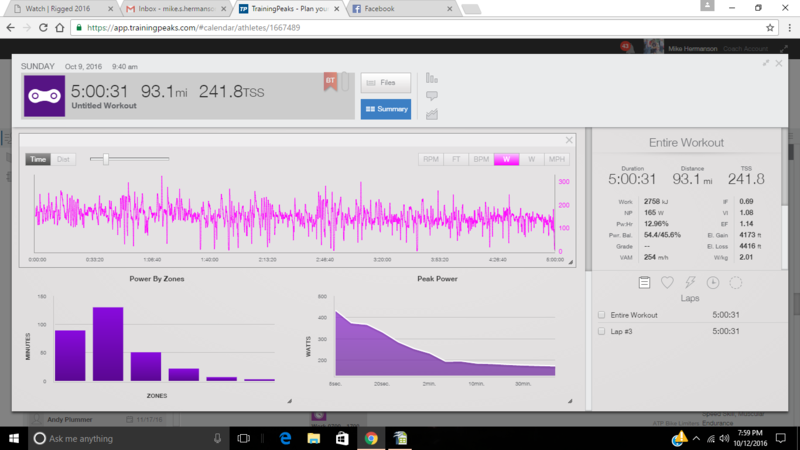 I wanted to take time to publish an analysis of the power data from the bike and break it down so you can learn better how to ride your bike in a Ironman race. The first thing I want to point out is the IF of .69 average between the two files. This athlete was biking at about 69% of their FTP. The suggested IF to ride at for an IM ranges from 68-78%. 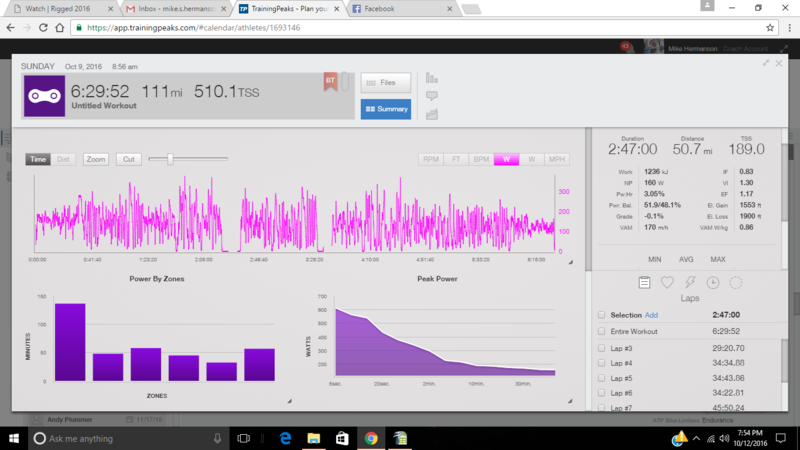 Again, IF = NP/FTP (you will see some professionals riding about 80% of FTP… that is because they are riding much faster than the average AGer). IF, NP and time on the bike is what determines TSS. The suggest TSS for a IM bike ride is 260-280. Some proven good runners off the bike can sustain as high as 300 TSS in a IM Bike split. You can see that the sum of the 2 files’ TSS is about 284 TSS. This athlete is on the high end of normal TSS. I suggested he ride 160-170w because I knew based on previous calculations and estimated time on the bike he should end up in the range of 260-280 TSS. He hit that target nearly perfectly. Another thing I want you to see is the VI (Variable Index). Variable index is calculated like this: VI = NP/AVG POWER. It is impossible to get a lower VI of 1.00 because of the way NP and AVG power is calculated. If someone rode a VI of 1.00, it means they maintained extremely even power the entire time. Basically keeping the power output within 10 watts+/- of the average power the entire time. The further that VI gets away from 1.00, the less even power was produced, and thus means the rider rode very inefficiently. Think of like driving a car. The most efficient way to get somewhere is hitting the cruise control. If the driver is constantly breaking and/or accelerating, the car will burn more fuel to go the same distance. In an IM race, getting a VI of 1.05 is considered very good. Between the two files, this athlete averaged about 1.06. 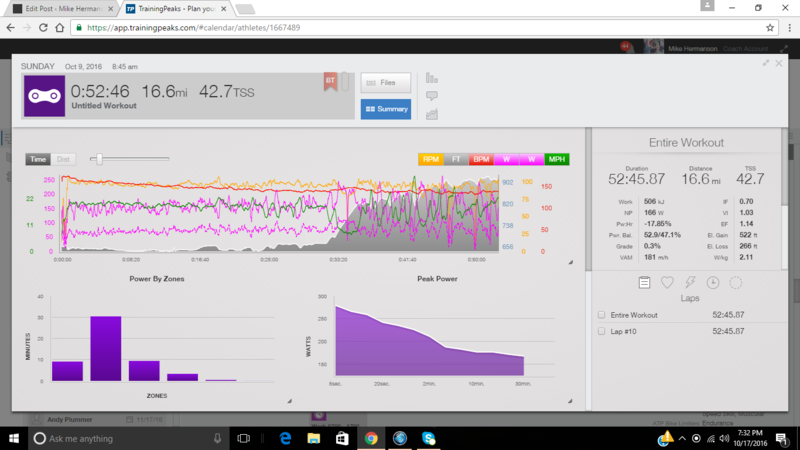 This means this athlete rode a fairly consistent power output throughout the entire 112 miles. This is obvious in the second screen shot above by removing all the other data plots. One can see how the line stays between two tight points most of the time. By riding like this, an athlete sets them up for a better run off the bike for a IM race. So the things I want to point out here is the TSS, NP, VI and IF. Again, these things kind of go hand in hand. This athlete averaged 135 watts for the bike ride. I told the athlete to aim for about 130 watts. So at first glance, this athlete appears to have done well. But what you need to look closer at is HOW he averaged that 135 watts. It wasn’t through smooth, efficient power as evidenced by his VI being 1.30 for the 112 miles. You can see how the power data points are all over the place and not tightly packed into small range of data points. Remember that VI is calculated like this: VI = NP/AVG power. To get a VI as high as 1.30, your NP must be significantly higher than your average power. NP influenced the athlete’s IF to be 90% of threshold. Because his IF was 90% of threshold and he rode his bike for nearly 6.5 hours, his TSS was about 510! Remember, suggested TSS for a IM bike is 260-280 TSS. He was almost double the low end of the suggested range! By riding like this, the athlete most likely didn’t run close to his potential. As you can see, athlete #1 rode his bike more efficiently that athlete #2 and set himself up for a better run off the bike for IM Louisville. I did get permission from both athletes to share their data while keeping them anonymous.